How to maximize your exposure in this market? Global Axellence, Inc. is a proud member of the National Association of Realtors, the Florida Association of Realtors, the Central Florida Realtors Association, and a member of the French-American Business Council of Orlando. Our team is composed of licensed real estate professionals from different areas of the world in order to ensure a certain International presence. SPeaking the language is not enough to thrive in this industry and gain the trust necessary, therefore all agents represent Buyers/Investors from their own area. Most agents should use the MLS, national and local promotion on the Internet, yard signs, as well as ads in various real estate publications. But don't you think all this seems a bit restrictive to market your house, building, land or business for sale? Global Axellence does more than that! We have been working the International market for years now and we have close relationships with many Real Estate brokerage firms all over the world, including Western Europe, the United Kingdom, Eastern Europe, South America, Canada, Australia and soon Asia to promote properties Globally! Moreover, many other countries have stronger currencies than the US Dollar, giving them the purchase power you wouldn't have the other way around. 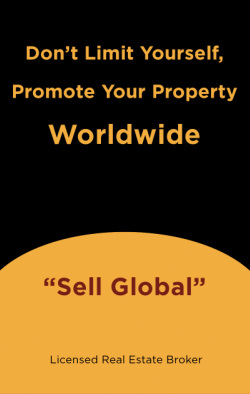 Our company will promote your property locally as well as globally as the probabilities of having a buyer everywhere else than Central Florida are far greater! This exposure gives you a cutting edge in Global Real Estate, on a personalized level tailored to fit your needs. People often ask what does Global Axellence provide over a local real estate firm. The answer is simple: we add another dimension to your property's exposure. Global Axellence reaches out not only the local and national Buyers, but also to the key players in today's market, which are the cash International Buyers and Investors who take advantage of the currency exchange. Over the years, Global Axellence has been able to gather a pool of investors our listings are first shown to. Then, we have access to people who have been qualified, are ready to purchase and are looking now. If we take your listing, it's because we believe we can sell it. It often happens that we do not even have time to place the property on the MLS, that we have a qualified buyer signing the Offer. Our reach has no border and is expanding year after year. Some homeowners think that selling their own home will save money and give them an advantage over the Realtor-using majority. 1) You will be drastically limiting your property's exposure to potential buyers as it won't show in the MLS. It can take between 10 to 15 times longer to sell your home, especially in this market, with the mortgage payment still due! 2) Most buyers find negotiating with sellers extremely awkward, therefore avoid For Sale By Owner situations. 5) If you plan to use a lawyer to help you negotiate, your lawyer's fees could be considerably higher than a Realtor's commission (even if no closing occurs). "Axelle is an accomplished business woman. She is very sharp and trustworthy. "- L. P., Bay Hill FL. "I really can't recommend Global Axellence, and the Broker Axelle Rayrolles highly enough, she has a fantastic local knowledge, went to university in Orlando and is extremely well connected there. She gave my brother and myself a really insightful tour of the area, helped us find excellent tenants and made the whole buying process clear and easy. "Axelle is a detailed oriented personable real estate broker that goes above and beyond what's on the papers to make sure the property you buy (or sell for that matter) is up to code, free of any problems. She is a hands-on professional who does not hesitate to work through obstacles until they are levied for a smooth and clear transaction. She's a woman of her word who can be highly trusted professionally and personally.